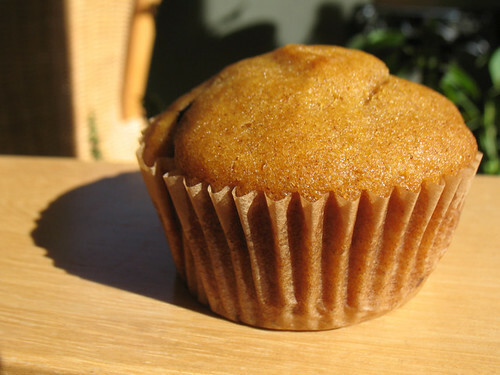 My Google Reader has pumpkin recipes up the wazoo these days – MoFoers are sharing the pumpkin love left and right, and beautiful orange baked goods are ubiquitous. It almost seems trite to make my own pumpkin-y post, but I’ll just tell myself I’m getting into the seasonal spirit. Unlike the tons of creative MoFoers who are sharing brand-y new pumpkin recipes, I’m just going to share a photo or two of some simple Pumpkin Chocolate Chip Cupcakes from VCTOTW. It’s difficult to go wrong with the pumpkin + chocolate chip combo, so these cuppers are super yummy. Light, fluffy, and smooth, they’re perfectly delicious. I left these cupcakes nekkid because a. I didn’t feel like making frosting last night, and b. I only made three traditional cupcakes. The rest of the batter was used in a Halloween-themed mini-cake pan I recently acquired. I’m not posting photos of the results because this was just a test run; I needed to see how high the cakes rise so I can judge how much batter to use next time I make them. But I’m preparing to make some cute Halloween baked goods, so expect to see those soon! I promise to have more inspiring/inspired posts for this final week of MoFo – I can’t believe it’s almost done! This month has flown by. My oh my.